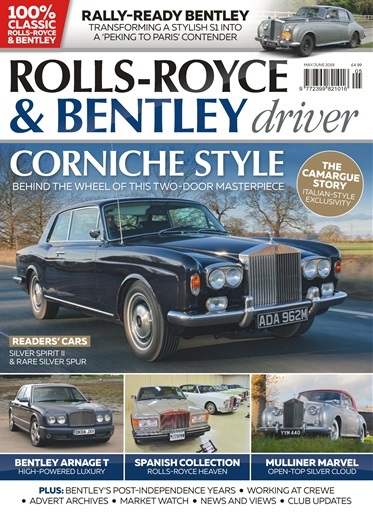 (0 Customer Reviews) | Write Review 6 issues per year Celebrating two of Britain’s most prestigious automotive marques, Rolls-Royce & Bentley Driver magazine is the definitive quarterly publication for all Rolls-Royce and Bentley enthusiasts and owners. Principally focusing on the classic models of these luxurious car brands, it will offer comprehensive coverage of the most popular versions from both Rolls-Royce and Bentley, ranging from immediately after WW2 up to around the turn of the millennium. Undoubtedly, there will be some coverage of pre-war models, and we will feature modern classics such as the Bentley GT coupe. Whatever the model, however, our aim with Rolls-Royce & Bentley Driver magazine is to offer a mix of owners’ stories, buying advice, technical hints and tips and inspiration on how to restore, maintain, and, crucially, enjoy your favourite Rolls-Royce or Bentley. Celebrating two of Britain’s most prestigious automotive marques, Rolls-Royce & Bentley Driver magazine is the definitive quarterly publication for all Rolls-Royce and Bentley enthusiasts and owners. Principally focusing on the classic models of these luxurious car brands, it will offer comprehensive coverage of the most popular versions from both Rolls-Royce and Bentley, ranging from immediately after WW2 up to around the turn of the millennium. Undoubtedly, there will be some coverage of pre-war models, and we will feature modern classics such as the Bentley GT coupe. Whatever the model, however, our aim with Rolls-Royce & Bentley Driver magazine is to offer a mix of owners’ stories, buying advice, technical hints and tips and inspiration on how to restore, maintain, and, crucially, enjoy your favourite Rolls-Royce or Bentley. You'll receive 6 issues during a 1 year Rolls-Royce & Bentley Driver magazine subscription. 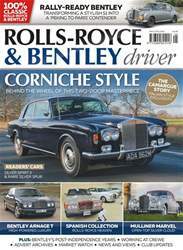 You'll receive 6 issues during a 1 year Rolls-Royce & Bentley Driver magazine print subscription.